New Zealand’s coat of arms features a Māori warrior and a European woman facing one another on either side of a British crown and a shield with symbols of New Zealand’s identity. The first New Zealand coat of arms was introduced in 1911, but many departments continued to use the British royal coat of arms. The current coat of arms was adopted in 1956. The coat of arms is a national symbol used to represent a country, at home and internationally. New Zealand’s coat of arms may only be used by the state. It appears on public buildings, courthouses and official documents such as passports. Unlike the national flag and anthem, the coat of arms has not been controversial. The current design was adopted in 1956. A British crown is at the top, representing historic ties to Britain. The words ‘New Zealand’ are at the bottom, with fern leaves behind. In the centre is a shield with symbols of New Zealand – the Southern Cross constellation, a sheaf of wheat, a lamb’s fleece and two hammers (representing mining or industry). Flanking the shield are a European woman holding a New Zealand flag and a Māori warrior with a taiaha (fighting staff). When New Zealand became a British colony in 1840, the British royal coat of arms became New Zealand’s coat of arms. 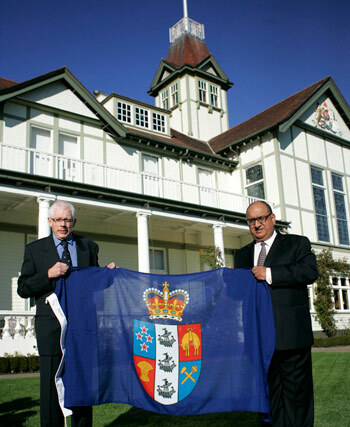 After New Zealand was granted dominion status, a competition was held in 1908 to design a coat of arms. There were 75 entries, and three were sent to Britain for consideration. New Zealand’s first coat of arms was adopted in 1911. However, it was not often used. Some government departments continued to use the royal coat of arms. In 1956 the coat of arms was redesigned. Officials wanted a coat of arms that was more clearly linked to New Zealand – and more attractive. The new design was based on the 1911 coat of arms, with several changes – the Māori and European figures were repositioned, the words ‘New Zealand’ were added, and the lion at the top was changed to a crown. The seal of New Zealand is used to authenticate official government documents. It can be used by the Queen or the governor-general on the advice of a government minister. The current seal was introduced in 1959 and is the first to include the New Zealand coat of arms. There have been seven different designs over the years. The seal is also the basis for the Queen’s Royal Standard of New Zealand, her personal flag for use when visiting New Zealand.